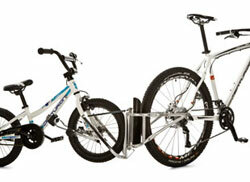 is a clever parental tandem hitch that makes family cycling a safe and fun experience in an instant. The two-point support at hub level ensures safety, ride comfort, and stability. While connected to the adult bike, the child’s front wheel and handlebars are fully blocked. Attach your child’s bike to your bike for traffic situations or if they have become tired. FollowMe lets you react quickly to changing situations – without the need for tools! Then, as soon as you feel the time is right, the youngster rides solo again. Above that; with FollowMe you can transport a second child’s seat and your shopping on a carrier. You can couple your child’s bike in no time and without tools or additional parts in a few short moves. You set-up both the parent’s and child’s bike only once by installing the special FollowMe components. For the adult bike, this comprises a quick release skewer or spindle adaptor. For the child’s bike you fit a clamp on the down tube and 2 spindle adapters. Once this is done you can firmly connect the bikes together in no time and without tools. After use and when a child is not being towed, fold up FollowMe and attach it to your pannier rack or saddle with the karabiner fastener. 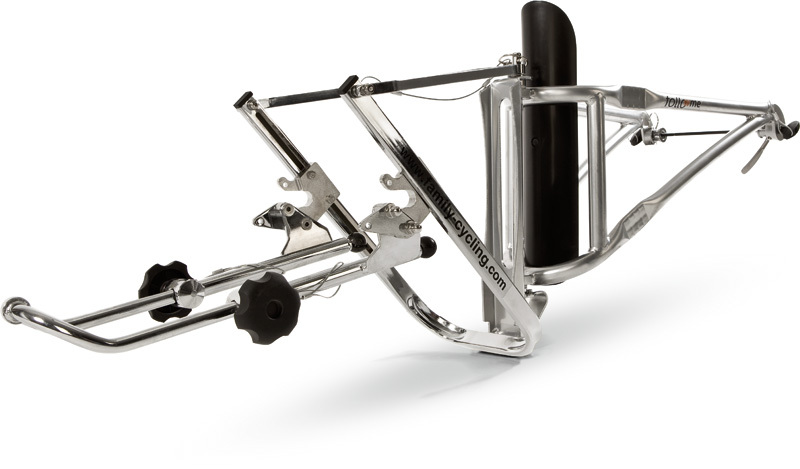 For cycling without children, the complete FollowMe hitch can be removed from the parent’s cycle in no time. With FollowMe, you can transport a second child’s seat an your shopping on a carrier. Your child and its cycle will grow – this is no problem for FollowMe. Kid’s bikes from 12” to 20” can be adapted – child’s age approximately from 3 to 9 years. Children’s cycles: Adjustable for all the usual size from 12“– 20“ (age 3 – 9 years). Parent’s cycles: Suitable for all 26” to 28” – and 29” with max. 2.00 tyres, wheel bikes. 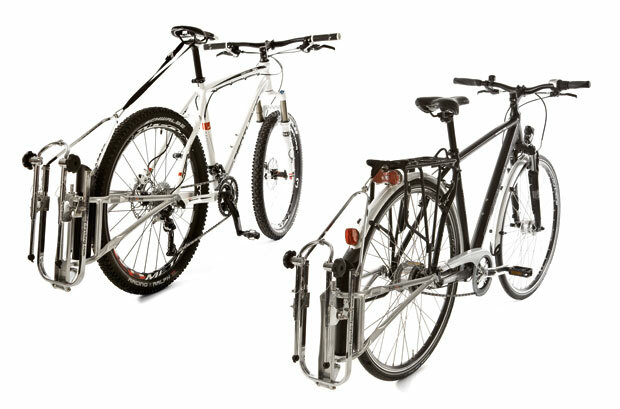 Including Citybikes, E-bikes, Roadbikes, Touringbikes and Mountainbikes (incl. full suspension). FollowMe is supplied as standard with a quick release skewer. Adaptors are available for wheels with a solid spindle or hub gears. Material: Steel, paint coated, galvanised. Towing Weight: TüV approved up to 45 kg. Additional load: A rear mounted child seat, pannier rack and side panniers can be used without any problems. 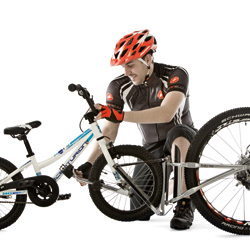 Accessories: Installation sets for equipping additional adult’s or child’s bikes are available.